· Steel runners with Steel Races and Groove Ball Bearings. · Suitable for 17mm grooved drawers. 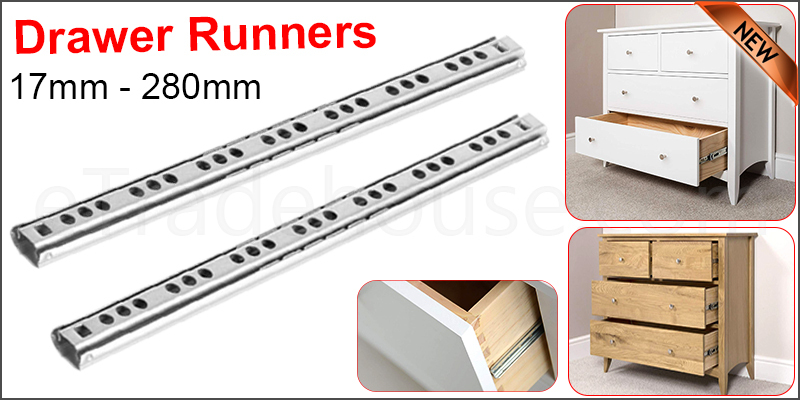 · These Drawer Runners are sold in pairs,have quick disconnect and stay closed locking feature. · In some instances, it may require new hole positioning when fitting, depending on age of furniture. · Fixing Kit not included but can be purchased from our store. 1. To find the runner size you need close your runner and measure this length. 2. This does not have to be an exact match just as long as the runner is shorter than the depth of your cabinet. The longer the runner, the better the opening of the drawer.